Q&A Weekends: How do you come up with a Minimal Viable Product when you want your business to be based around information? 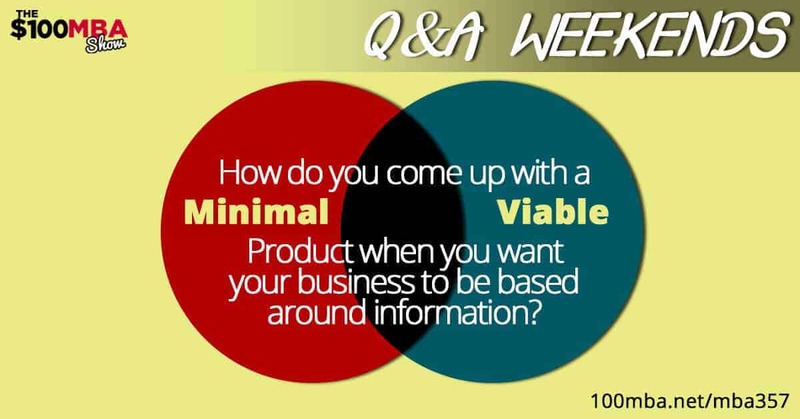 MBA357 Q&A Weekends: How do you come up with a Minimal Viable Product when you want your business to be based around information? Yes, you can definitely come up with a minimal viable product when you have a business with an information-based product. In this lesson that we’re gonna teach you today, we aim to help you come up with your own minimal viable product and share with you some tips and strategies on how to do it. Press play now! Explore thousands of online classes in design, photography, business and more! Join our learning community with over 1 million creators and thousands of online classes in one place. The $100 MBA Show listeners! « Previous Post MBA356 How Big Should Your Team Be? Plus Free Ride Friday! Next Post » MBA358 Q&A Weekends: Are blogs a necessary requirement to go along with your podcast?